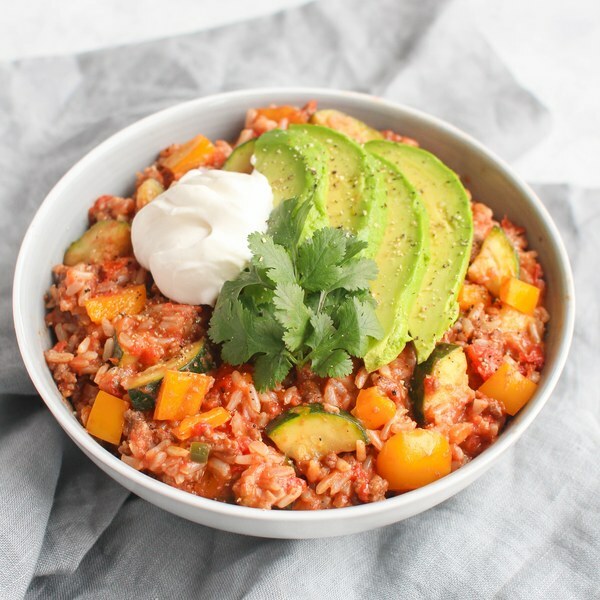 ← Cheesy Beef Rice Skillet with Peppers & Zucchini. Once the water for the rice comes to a boil, stir the mixture, cover the saucepan, and reduce the heat to low. Cook the rice until the liquid is fully absorbed, 15-18 minutes. Once done, remove the rice from the heat and let it stand, still covered, for 5 minutes. Small dice the peppers and zucchini; transfer to a medium bowl. Quarter the jalapeño peppers lengthwise; seed and remove ribs of the jalapeño with a spoon. Finely dice and add to the bowl with the peppers. (Be careful, with jalapeños, do not touch your eyes and ensure you wash your hands after handling or wear gloves while preparing). Place a large pot over medium heat, add the ground beef; cook, breaking apart with a spoon, until browned and crumbly, 7-10 minutes. While the meat cooks, peel and small dice the onion and peel and mince (or press) the garlic; add to the bowl with the other veggies. Once the meat is done, transfer to a bowl, leaving juices in the pot. Return the pot to medium heat. Add the veggies in the bowl to the pot. Cook, stirring occasionally, until the veggies are tender, 5-7 minutes. Add the tomatoes with their juices, salt, and pepper to the pot. Stir to combine and let simmer on low, 3-4 minutes. Fold the cooked rice, cooked beef, and grated cheese into the pot. Halve and pit the avocado. Slice thinly while still in skin, then scoop out with a spoon. Divide into bowls and top each bowl with sliced avocado, yogurt, and chopped cilantro. Enjoy!